In many professions, networking is a key part of a successful business. Real estate is no exception. In fact, networking is a vital component of the real estate profession. Why so i mportant? For instance, let’s say you’re a Realtor® who just listed a new property in Yorktown, VA. How do you market this home? Although many would answer through the Multiple Listing Service (MLS), marketing is more than just “listing” a home. Marketing is about spreading the word and differentiating this home a midst all the others. In 2012 the second most popular method of finding a home was through a real estate agent (with the first of course being the internet). Therefore, it’s important to network with other Realtors® in order to build connections. I’ve been known to sell homes BEFORE they come on the market simply by word of mouth. There are many opportunities to network that can be both business and non-business related. Business events are very successful in connecting Realtors® with affiliates and other Realtors®. 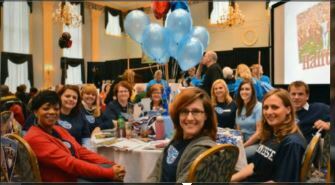 Events can range from company events to the Chamber of Commerce to local Realtor Association socials. Non-business events are also important and ways to network with potential clients – and can be fun! These are the activities you already participate in within the community and events that you enjoy. As a client, it’s important to ask your agent how he/she networks in order to optimize your chances of selling.